I happened to look up this morning as I was glancing over the smarmy chosen few purportedly "news" stories being touted by the corporate media and saw this accidental imagery on my husband's computer screen. I asked him to do a screen capture and send it to me. 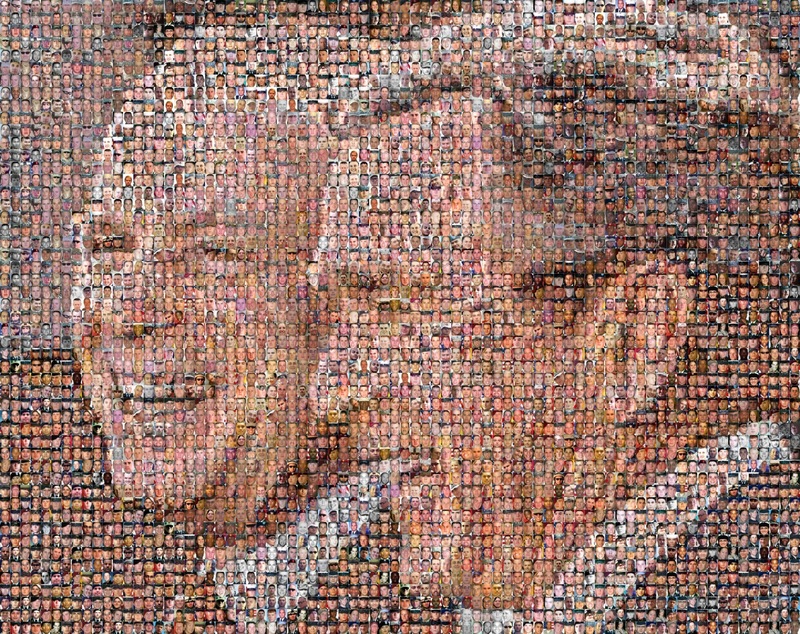 It doesn't show either composite picture in its entirety but it gives a chilling visualization of how far we've come -- in the wrong direction -- since the first portrait of bUsh (emphasis on U because you haven't acted) created from the faces of our dead due to their handling and exploitation as corporate mercenaries circulated on the internet. Look how far we've come. All the way from one psycho bUsh to psycho wannabe Insane McCain. Yes, I'm pissed, outraged , grieving, and murderously agitated that we've reached tombstone (definitely not a milestone as milestones are supposed to mark achievements) publicly acknowledged number of 4000 U.S. military dead. And unfortunately this number doesn't come anywhere close to showing the HORRIFIC numbers actually associated with this immolation of a people. 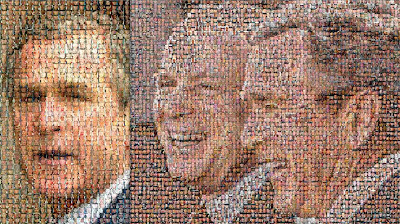 Labels: 4000, Bush, dead, images, McCain, mosaic, portrait, soldiers, U.S.
Meet the Press this morning framed an equality where there is none. (Read they lied through omission.) Why didn't Russert show the video of the arrival Senator Hillary Clinton in Tusla juxtaposed with her rather blatant lie about arriving under sniper fire in order to beef up her supposed foreign affairs experience. He shows the Reverend Wright video one more time but fails to show the video of she and Chelsey strolling across the tarmac, greeting leaders, and hugging little girls. Clinton better not complain ever again about how unfairly she is treated by the media. Why the hell doesn't the press put her "sniper" talk over a split screen with the Kosovo video and show it nonstop for two weeks and then take a poll? This is one of the most blatant and thus excellent examples of how the Democratic Machine/DLC operates. Note: There is nothing about the DLC that reflects any sentiment of the vast majority of people who make up the Democratic voters. "Party" candidates and "Peoples" candidates within the U.S. political parties are very different critters. Pre-National Convention party candidates such as Hillary Clinton act as though they have an entitlement to be on the ticket. This scares me. What scares me even more this corporation/party lock-step is that the Clintons (both of 'em) seem to have no qualms about altering facts and presenting them as truth. And even more chilling is that this means that they have come to believe their own lies or that they believe they are above "mere" facts. This is eerily reminiscent of the Ranters of the 1600s who like all good Calvinist-influenced sects believed success in life (business and politics) illustrated favor by God, and as favored they were good, pure and predestined to be saved and thus not bound by Puritanic rules. It is convoluted, but no more circuitous than Hillary's association with the conservative cult-like group on Capitol Hill. Acting from a position that you are doing X, Y, or Z because you are favored by God is a stance that has no place in American Politics. Don't ask Obama why he attends a Church of Christ, ask Clinton why she is a member of "The Family?" Don't know who the The Family or The Fellowship is? Read on and be very, very frightened. Perhaps today, this Easter, this most sacred of days in the Christian faith, real Christians who follow the teachings of Jesus should finally out the closet fascists hiding under the cloak of Jesus. Barbara Ehrenreich writes on Thursday, March 20, 2008 in the The Nation that Hillary Clinton has far more unsavory religious connections than Obama could ever dream of having. "You can find all about it in a widely under-read article in the September 2007 issue of Mother Jones, in which Kathryn Joyce and Jeff Sharlet reported that “through all of her years in Washington, Clinton has been an active participant in conservative Bible study and prayer circles that are part of a secretive Capitol Hill group known as “The “Fellowship,” also known as The Family. But it won’t be a secret much longer. Jeff Sharlet’s shocking exposé The Family: The Secret Fundamentalism at the Heart of American Power will be published in May." CNN Experiences Wrath of God. CNN experiences wrath of God. Tornado hits CNN center in Atlanta. Maybe the newscasters should think twice about their discrediting the sermons of Rev. Jeremiah Wright. What in his statements isn't true? The horrific Pandora-esque destruction of Hiroshima and Nagasaki was far worse than 9/11. Rich white men do rule the world and have done so for hundreds if not thousands of years. Gimme a bleeping break. Why can associates of corporate candidate A cast aspersions of all sorts when associates of corporate candidate B cannot. Let's not even discuss the gross insensitivity and implicit devaluing of life the singing of "Bomb Bomb Bomb, Bomb Bomb Iran " corporate candidate C- also known as corporate Manchurian candidate McW. Why don't the corporate newscasts highlight the apology Senator Clinton had to make for her associates racist comments? Sorry, haven't posted a rant in a long time. New media with blogs from diverse sources has changed the flow and quality of information available to global citizens. Please help out the network of women bloggers with whom I work and take this survey. Click the image. Ups & Downs of Computers, Activism, and Life. Sorry about the hiatus in posting. How many hard drive failures is normal for a laptop user who works on her laptop for hours every day? I've either had logic board or hard drive failures (not just crashes) every few months for the last several years. I'm on a Mac. I try not to be paranoid, but.... I'm beginning to be suspicious. Of what I'm not sure and I don't live my life walking around in a general state of paranoia... but I , and some CODEPINK friends, do tend to have our hard drives fail within a week or so of major national level actions. It could be coincidence, but the probabilities are slim. In any case I have a new hard drive and am raring to go. Thank the Great Pink Goddess in the sky that my laptop is new and under warranty. Thank the GPG that Macs exist. Thank the GPG for my resilient nature. Thank the GPG for all the women who compose the contemporary peace net that shifts to compensate for the fluidity of women's actions that compose the net. Been doing less and less local activism and trying to find the perfect balance that allows me to operate in a non-frantic manner and write about the things that are truly meaningful to me. I also work toward finding a significant position as I re-enter the job market with a "real" job. I do not regret a minute of the last many years of effort I have directed toward peace. I'm into the 6th very active year of making positive protests for peace (pro + test = for + statements) as it was in February of 2003 that I honored the call for women to join together to march together in public affirmation of American women's desire that their children not be used to make war upon any people and to direct every resource possible, including our children's efforts, into making peace. That simple act of finding a pink item of clothing to wear and taking the Metro into D.C. to join together in protest with other individual women as a visual cue in a huge march and to then march again with thousands of pink clad individuals (women and men) a couple weeks later in an affirmation of values of peace and positive action under a pink banner forever changed my life. I will never be able to leave the peace movement. It is now part of me. Efforts change over the years though and I find that now I have to dedicate a much greater portion of my time to paid work. Six years is a long time to donate most of your services to a cause. While I have focused on my child and my parent through this time period I no longer have to dedicate myself so fully to family and work in my peace work around that. My daughter is in college now and I will have time to write and work in the evenings and weekends via social networking technologies, so you won't see a real change in my blogging, but the framework for me will be very different. If you think you know of worthwhile job in the Tucson area that calls for someone with my skills, please do consider linking me up with it.